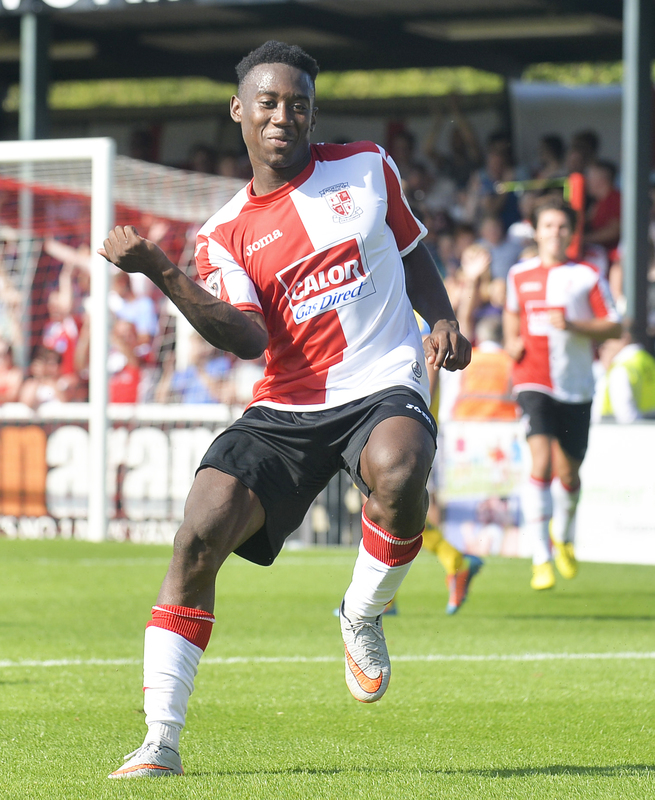 WOKING continued their blistering start to the new campaign as they edged out Chester in a seven-goal thriller on Saturday. This goal-fest of a victory now makes it four Cards’ wins from their opening five games of the new Vanarama National League season. Scorching late August sun streamed down on a sizzling Laithwaite Community Stadium to set the scene for the hottest game of Woking’s blazing start to the campaign. A lukewarm start to the on-field action was turned up a notch when the visitors’ young centre-half Ben Heneghan conceded a 23rd-minute penalty and was sent for an early cold shower by referee Mark Pottage. Cards’ in form playmaker, John Goddard, stepped up to coolly convert the spot kick amid the sweltering scenes to spark the game into life as Woking looked to make full use of their numerical advantage. It was one of those days for visiting boss Steve Burr and his Chester side, whose delayed team coach had arrived at Kingfield just 45 minutes before the 3pm kick-off. But credit to the Blues – aptly lining up in their change strip of sunshine-yellow shirts – who pluckily made a game of things despite being a man light for two-thirds of the contest, and with the mercury hitting the high 20s on pitchside thermometers. Not that there was much shade to be had, just a sliver running across the six-yard in front of the Leslie Gosden stand, but the away side had shaded the opening exchanges before the speedy feet of Dan Holman had induced that early, game-changing infringement from Heneghan. Loan forward Holman has made a suitably speedy start to his month’s loan spell from Colchester United, and he almost added to his debut goal against Altrincham with an early header. Man of the match Keiran Murtagh put in another confident, strolling display from his midfield station to once again pull the strings for Cards boss Garry Hill. While others were inevitably flagging in the searing afternoon heat, Caribbean native Murtagh was finding his rhythm, and sent a sweet left-footed half-volley just the wrong side of John Worsnop’s post and into the side netting after half an hour’s play. A swing of momentum saw the hosts firmly in control as the welcome half-time refreshments neared; Holman miscuing a cross to Goddard who was well-placed to double the advantage just before the break. During half time all sides of the ground joined in applause as Cards’ injured striker Scott Rendell was presented with a cheque made out for £12,470, raised courtesy of the club’s Crowdfunding drive. The fans’ fundraiser has made headlines and netted pledges from around the footballing world to support last year’s Player of the Year winner during his enforced absence this season. The innovative cash builder is a notion familiar to fan-owned club Chester, whose supporters have set up an account in a bid to bolster boss Burr’s playing budget by £20,000 this term, as the Cheshiremen look to improve on last season’s 12th place finish in the National League – when they finished 13 points behind Woking who memorably took seventh place in their push for the play-offs. Five games into the current 46-game marathon, Hill and his men are currently second only to leaders Forest Green Rovers in the early standings – with big spenders Rovers posting a 100 per cent record, thus far. Back to Saturday’s action and, sufficiently cooled by the half-time oranges, Hill’s Cards began the second period in the same vein as they had finished the first to grab the crucial second goal through a Holman stunner. Receiving the ball from midfielder Joey Jones on the right-hand side of the penalty area Holman made half a yard of space to bend a delightful left-footed curler around a wall of yellow shirts and inside keeper Worsnop’s right-hand post with just two minutes gone in the second half. Keeping up their stranglehold on the game, Charlton Athletic loan youngster Kadell Daniel added the third seven minutes later. If Holman’s left-foot curler was a sight to behold, Daniel’s dipping, whipping free-kick from out on the right touchline was simply stupendous. Tenacious Chester kept the flood of goals coming just after the hour mark when substitute Michael Kay glanced home a John Rooney corner. Cards’ treble advantage was restored with 15 minutes left as midfield grafter Jones ended his own 2015 goal drought with a smart finish from the edge of the box, before boss Hill sent on Godfrey Poku and former QPR youth side team-mates Bruno Andrade and Ben Pattie to work up a sweat with 10 minutes left. Striker Pattie had made a brief Cards’ bow as a late substitute in the dramatic 1-0 midweek win at Torquay United, and the 19-year-old was in the thick of the action again as he almost grabbed a goal within minutes of coming on – his strike from the left edge of the penalty area narrowly deflecting wide of the target. Despite the referee’s watch ticking over the 90-minute mark, there was still time enough for two more goals to complete the seven-goal shower. It’s a familiar sight and sound, a fizzing free-kick flying into the top corner of the goal net accompanied by the cry of ‘ROONEY’ from the match commentator. This time it was John, younger spouse of England skipper Wayne, in control of the deadball but the result was no less spectacular as his effort whistled past Jake Cole in the Woking goal. Cards’ own livewire youngster Pattie then wasn’t to be denied at the second time of asking as he marked his home debut with a first senior goal; calmly lifting the ball over the onrushing Worsnop from eight yards. When the man in the middle finally did call time on a sweltering day’s action, delighted Woking boss Hill praised the commitment of his side after their long mid-week round trip to Devon. A satisfied Hill added that he had asked for a disciplined performance from his side at half-time to avoid looking the gift horse – of three points against 10-men – in the mouth as Woking moved into second place in the table. “I said to the players, ‘just keep your discipline as much as possible, play the game at a good tempo and make the pitch big’. “We could have had a few more goals. We’ll probably be a little bit frustrated in one way at the cheapness of the goals [conceded] even though the free-kick from the boy Rooney was a great effort. “To have 12 points out of 15; four wins out of five, basically with a new transition [of players]… we’ve probably got off to a better start than we expected. It’s really carrying on the momentum of last season.